PROPERTY SUMMARY A three bedroom end of terrace family home which is situated within easy access of commutable road and rail links, schools, recreation grounds and bus routes. 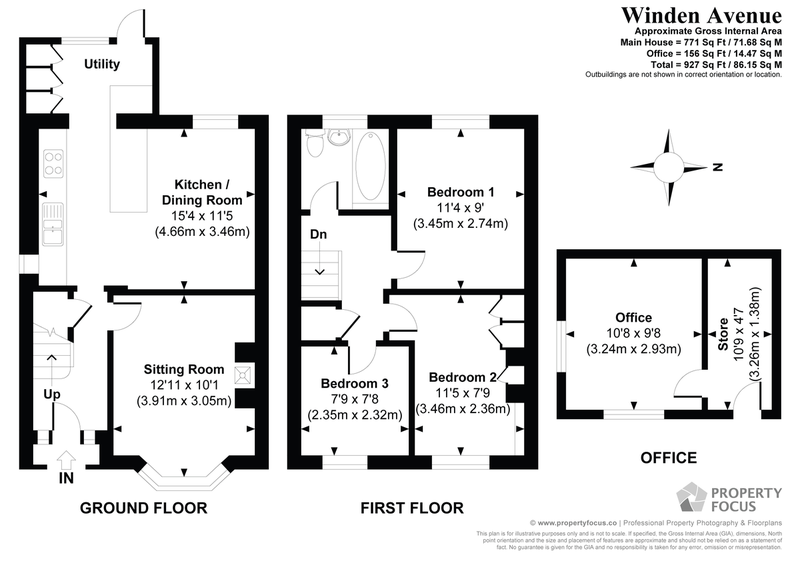 The accommodation is arranged over two floors and comprises; hallway, sitting room, 15' kitchen incorporating dining area and utility area on the ground floor with three bedrooms and a bathroom on the first floor. Within the enclosed rear garden is a detached home office/gym with side pedestrian access and off road car parking to the front for two cars. Offered with no forward chain, double glazing, gas fired central heating, some oak flooring to primary rooms, early internal viewing is strongly recommended in order to appreciate both the accommodation and location on offer. HALLWAY Solid oak flooring, wooden skirting boards, radiator, cloaks hanging area, picture rail, balustrade staircase rising to first floor with understairs storage cupboards, doors to primary rooms. SITTING ROOM 12' 11" x 10' 1" (3.91m x 3.05m) Solid oak flooring, wooden skirting boards, double glazed bay window to front aspect with shutter blinds and radiator under, picture rail, recess to chimney breast with log burner (not tested) and tiled hearth, power points. KITCHEN INC. DINING AREA 15' 4" x 11' 5" (4.65m x 3.45m) Increasing to maximum 17'1" into utility room. Kitchen area; comprehensive range of matching wall and floor units with roll top work surface, inset 1½ bowl stainless steel sink unit with mixer tap and cupboard space under, one cupboard housing gas meter, corner display shelving, small frosted window to side aspect, ceramic tiled surrounds, power points, inset four ring gas hob, oven under, stainless steel splashback, extractor hood, fan and light with range of drawers to either side, one wall mounted unit housing boiler supplying domestic hot water and central heating (not tested), square opening leading to utility room, peninsular style divide with range of cupboards under accessible from both sides, tiled surrounds, integrated fridge and freezer with matching doors, power points, wooden flooring. Dining area; double glazed window to rear aspect, ceiling spotlights, picture rail. UTILITY ROOM Solid oak flooring, wooden skirting boards, radiator, washing machine point with space over for tumble dryer, power points, coir matted area, double glazed door with window to one side leading to rear garden, range of full height larder style storage cupboards, ceiling spotlights. FIRST FLOOR Landing, doors to primary rooms, access to loft space, built-in cupboard with range of shelving. BATHROOM White suite comprising; panelled bath with separate Triton shower over with rail and curtain, pedestal wash hand basin, low level w.c., fully ceramic tiled to floor and walls, double glazed frosted window to rear aspect, radiator. BEDROOM 1 11' 4" x 9' 0" (3.45m x 2.74m) Double glazed window to rear aspect with shutter blinds with radiator under, picture rail, panelled door, power points. BEDROOM 2 11' 5" x 7' 9" (3.45m x 2.34m) Double glazed window to front aspect with shutter blinds, picture rail, recess to chimney breast with shelving, built-in wardrobe to one side of chimney breast with hanging space, shelf and storage cupboard over, radiator, power points, panelled door. BEDROOM 3 7' 9" x 7' 8" (2.34m x 2.31m) Double glazed window to front aspect with shutter blinds, radiator, power points, picture rail, panelled door.